The Mio Slice is a fitness tracker that believes you're not going to get fit just by counting steps, and instead shifts its focus to your heart rate. Mio has developed its own PAI metric to determine how active you've been during the week to help you get in shape. Think Nike Fuelband's Fuel points but with less of the waving of your hand to cheat the system. It still works like a Fitbit, so it'll track daily activity, workout sessions, automatically log sleep, and there are even some smartwatch-style features too. At $129, it's priced at around the same as the Fitbit Alta and a little cheaper than the Fitbit Charge 2, so it's going up against the biggest players in the fitness tracking business. The decision to embrace heart rate is not a major surprise, especially when Mio's previous devices, the Fuse and Alpha, were all about the BPM readings. While we've praised those trackers for their heart rate monitoring skills, there has always been plenty of room for improvement. So does the Slice cut it as a genuine Fitbit rival? Here's what we found out. If you were hoping for something sleek and stylish, then be prepared to be disappointed. Again. Mio hasn't really got the knack of making good looking wearables. What you get is a matte black TPU plastic band that's roughly about the same width as the Charge 2, an OLED display that's not touchscreen, and a physical button to skip through data screens. It's bland, uninspiring and pretty ordinary when you put it up against a nice hybrid smartwatch or even a cheaper fitness tracker like the Misfit Shine 2. There are some different colours (stone, sienna and navy) to choose from, but we're not all that sure that's going to make that much difference on the design front. It's available in two sizes, large and small, but even for slimmer wrists, the large strap fits pretty snug, so it's definitely worth checking out the measurement details if you've going to get a hold of one. It's a snug fit, but we're glad to say we didn't experience any skin irritation issues wearing it day or night. The close fit is needed to ensure the optical heart rate monitor - the same kind we've seen on Mio trackers previously - is close to the skin as it detects changes in blood volume. As far as durability and robustness is concerned it looks like a band that can withstand some rough and tumble, although that's not actually the case. The clasp holding the Slice in place around your wrist is clearly not secure enough and it didn't take much to see the tracker come loose on numerous occasions, even just wrestling with a jacket. On the plus side, it is waterproof up to 30 metres (100 feet) and it safely made it in and out of a swimming pool without issue. We should talk about the screen as well, because while it's perfectly fine to view indoors, it's more of a problem when you're outside. Even in moderately bright sunlight it's a challenge to properly read data off the screen. You can adjust the brightness, but the maximum brightness can't resolve the murkiness of the display. Before we move onto PAI score, the Slice does also pack in a pretty standard 3-axis accelerometer to track motion, providing data on distance covered, steps, and sleep monitoring. You'll also get an active calorie score that's based on Mio's own algorithms and the heart rate sensor readings. We put it up against the Fitbit Charge 2 and the TomTom Spark 3 and on most days it tended to be around 500 steps off from Fitbit and TomTom's tracking. We always make some allowances for some differences in the data because no tracker is based on the same algorithms, so it was at least in the same ball park. When it comes to sleep tracking, the data inaccuracies are a little more concerning, as the Slice appeared to record surprisingly short sleep times. Some nights we had apparently managed just a couple of hours when tracking with the Slice. Despite not being the greatest of sleepers, that still seemed wildly inaccurate, and not reflected in the Charge 2, Spark 3 and the Withings Aura sleep monitor that we also tested alongside. While there are no dedicated sports tracking modes, you can still log workout sessions, which is done by pressing down on the big button below the screen. It might show you a running icon, but it's about tracking heart rate here only. One problem is that it's extremely easy to accidentally launch a workout session. There have been a number of occasions where we've rolled up our sleeve to see the timer counting away. Now, we'd love to be able to show you all of this comparison data for this sessions, but unfortunately the Mio app only lets you review data from the past seven days, which we were unaware of when testing. So all of the data we've collected over the past month has gone. Fortunately, we made some notes along the way, but this seems like a massive oversight from Mio and if anything, a basic software requirement that should be included. We've been told that adding history and trends for sleep, resting heart rate and PAI scores is on the Mio roadmap, but there's no time frame for when that's going to happen. It seems very odd that this wasn't considered a feature that would be beneficial right from the off. So what is a PAI score? Mio's metric is based on age, gender, resting heart rate and maximum heart rate. It's calculated on a rolling seven-day score of your heart rate intensity and the aim is to keep it above 100. It is designed to really show how hard you have worked your body, whether you've been sedentary or really pushed yourself, and not simply just present you with the number of steps you've taken. Mio's algorithms are based on a long-term health study called the HUNT study, which found that resting heart rates can predict cardiovascular health. It also found that keeping your PAI score above 100 could add up to 10 years to your lifespan and help to protect you from lifestyle diseases. Now in theory, it sounds like a great idea. We've always debated whether step counting is really the key to getting you in shape. In practice, there's some good and bad in the PAI approach and its attempt to keep us motivated to stay active. The idea is that the higher you keep your heart rate, the more PAI points you unlock. You're given a total of 100 points to unlock every week and this system is broken down into low, moderate and high heart rate based activity. What you need to remember is that a big long walk is not going to get you the same kind of PAI points you'd get from a short interval running session. That makes sense in accordance with how the Slice and PAI aims to work. So when we entered a 10 mile race, we quickly notched up about 80 PAI points in a day. From a motivational point of view though, not even making a dent in that score psychologically can be deflating, which did happen on some lazier days. There's also nothing in the way of reminders to keep that heart pumping, which would've been a nice touch. If you're already at a good level of fitness, then you'll get a good sense of when you're dropping off from your routine and when you need to up your game. If you're a beginner, we're not sure what it'll do for your confidence when you think you've put in a good day's worth of strenuous activity, but you haven't hit those high BPM readings. It's no surprise to find that for a device that makes heart rate the focal point, it does a pretty admirable job of delivering accurate data. Mio's devices have impressed on this front in the past and it's more of the same with the Slice. We put it up against the Polar H7 chest strap and the TomTom Spark 3, which in our opinion packs in the best wrist-based heart rate monitor, and we were pleased with the results. Resting heart rate readings were consistent with the two other devices and it handled high intensity workouts on a stationary bike and out running with no issues. At the most it was 1 or 2 bpm out, but Slice on the whole delivers the goods. Mio might still be playing catch up on the design front, but it is at least embracing the idea of keeping you away from your smartphone, letting you view notifications from the Slice's display and working a bit like a makeshift smartwatch. You can't do things like control music playback, but it does double as a watch, using gestures to wake up the screen when you raise your arm. Unlike an Apple Watch or an Android Wear smartwatch, it's a lot more basic with notifications, flashing up calendar icons (not calendar items) to let you know an event is coming up, caller ID when someone tries to call your phone, or a simple flash of a contact name when a text comes through. There's no way to act on the notifications from the screen, and while there's no lag in their delivery, you will still need to pick up your phone in most cases as so little information is available on the tracker itself. If you've used Mio's companion apps before, you'll know things are kept pretty streamlined and, if anything, things get more basic in the Mio PAI 2 app. It's available for iOS and Android and now ditches the dark hue for something brighter and cleaner that makes data a lot easier to digest. The home screen is where you'll find you weekly PAI scores displayed and you'll get a pretty good idea if you're not keeping up. The second tab digs a little deeper, showing the daily breakdown of low, moderate and high heart rate scoring. You can also view activity tracking and sleep data, the latter of which is broken down into deep sleep, light sleep and awake time. As we've already mentioned, there's not much in the way of analysing data or trends over a period longer than seven days. The final tab is dedicated to customising the hardware and viewing battery status. It's here where you can set up notifications, rearrange device screens, adjust brightness and even switch on ANT+ in workout mode. Like we've said, it's very basic, and that of course has its advantages. But it does feel extremely threadbare in areas where it could do more as far as explaining how PAI works and how you can make improvements. Mio claims you should get up to five days of battery life from the Slice and that's pretty much what we've found over the last few weeks. That should be enough for using it during the day and while in bed. Throw in a workout session each day and you're going to get less than those five and closer to three or four days. It is at least a relatively speedy charger taking just over an hour to get back up to 100% power from 0%. The micro USB charging cradle clips securely into the back of the Slice and while it's initially a little fiddly to get it in place, it's not going to budge when it's propped up on your bedside table. 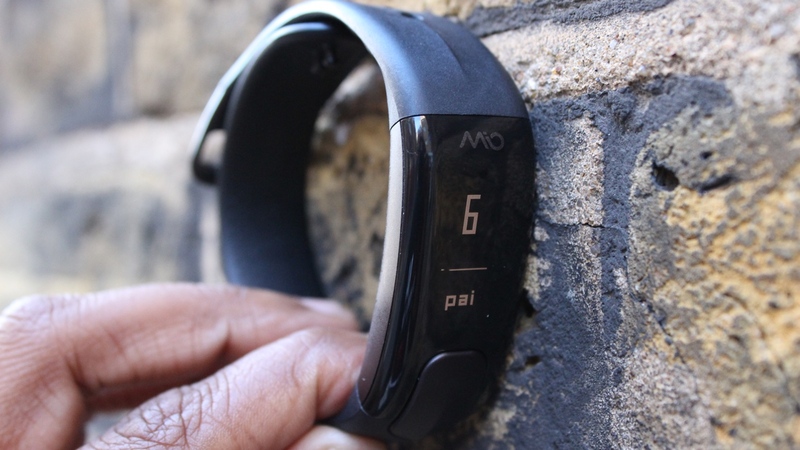 In the quest to stand out from the fitness tracking crowd, the Mio Slice doesn't quite hit the spot. We can definitely get on board with the concept of swapping steps for heart rate as a means to keep you more active, but the execution of that concept still needs work. Whether Mio cares or not, it needs to work on housing its tech into a more attractive body, while the software still feels like a work in progress. You can't fault this heart rate monitoring fitness tracker on the accuracy front, but it needs to do much more than that to convince us that PAI is the future of fitness. Is there any 24 hour fitness tracker with HR monitor and swimming capabilities, including the HR feature during swimming activities?? ?